G C Anupama, , IIA, Bengaluru, elected to Fellowship in 2016. 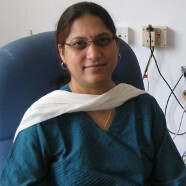 Anupama has expertise in the area of observational astronomy, in particular time domain astronomy. She specializes in the studies of eruptive transient variables. As a core member of the India TMT project, Anupama is responsible for the delivery of 90 polished segments of the primary mirror of the Thirty Meter Telescope, as a part of India’s in-kind contribution to the international project. She is a recipient of Government of Karnataka’s Sir C.V. Raman Young Scientist Award (2001). Time domain astronomy is a study of the variable sky. There are several variable sources, a good fraction of them being transient in nature. Some of the most energetic events in the Universe are the explosive transients gamma-ray burst sources (GRBs), supernovae and novae. GRBs and supernovae are the end stages of massive stars, while nova explosions are a result of matter accretion onto a white dwarf. The observational properties of these source will be described in this talk, using as examples the objects observed with the observing facilities available in the country.